GBIF is pleased to release IPT 2.2, now capable of automatically connecting with either DataCite or EZID to assign DOIs to datasets. 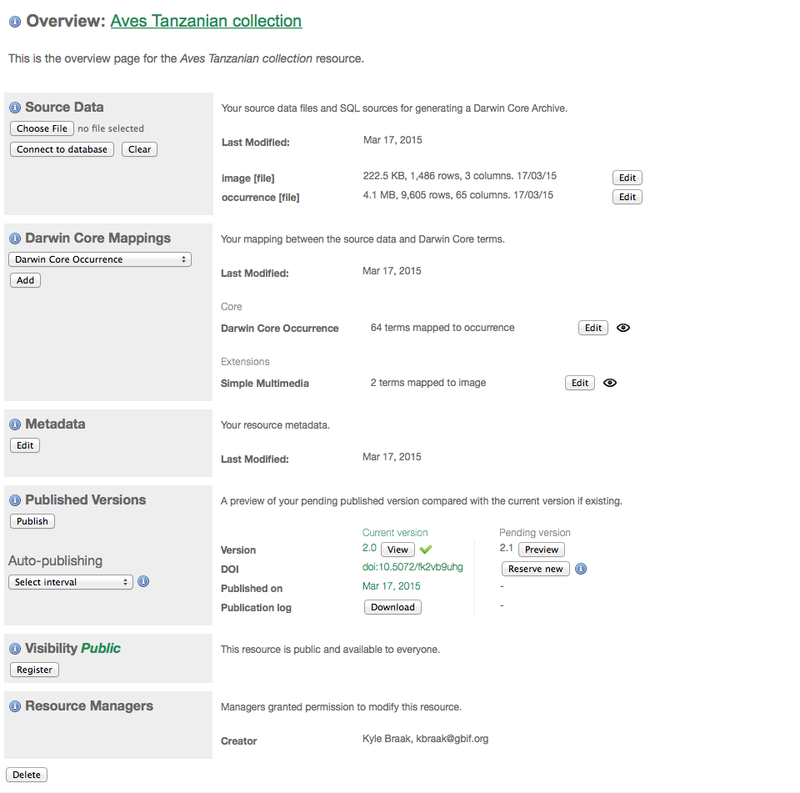 This new feature makes biodiversity data easier to access on the Web and facilitates tracking its re-use. EZID is hosted by the California Digital Library (a founding member of DataCite) and adds services on top of the DataCite DOI infrastructure such as their own easy-to-use programming interface. The IPT must be configured with either a DataCite or EZID account. 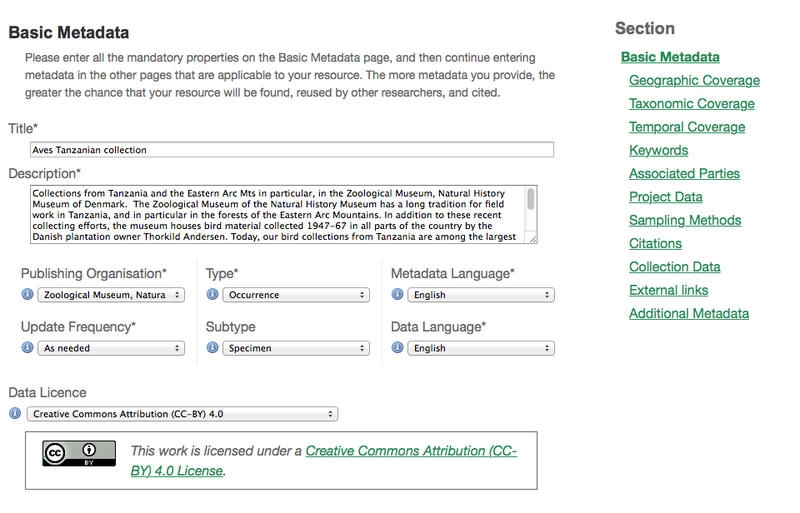 GBIF participants interested in a DataCite account should contact the GBIF Helpdesk directly. General information about getting a DataCite account can be found here; information about getting an EZID account can be found here. The IPT should be always on and accessible to ensure that assigned DOIs continue to be resolvable. The IPT 2.2 also introduces a simple way of licensing datasets under one of three machine readable waivers or licences: CC0 v1.0, CC-BY v4.0, or CC-BY-NC v4.0. These waivers or CC licenses are "something that the creators of works can understand, their users can understand, and even the Web itself can understand. "(2) You may read more about GBIF's new licensing policy here for more information. Lastly, a special thanks must go out to David Shorthouse from Canadensys for his guidance and help. Canadensys has been assigning DOIs to datasets it serves via its IPT since 2012, as described here, and has provided invaluable assistance throughout development. On behalf of the GBIF development team, I really hope you enjoy using this new version, and hope that you will be able to take advantage of all its exciting new features. Open blogging for developers working within the GBIF network; challenges, ideas, tests, research, data models, proposals and problem statements related to mobilising biodiversity data. All GBIF network developers welcome to join, and bloggers are encouraged to post in their preferred language. All posts represent the ideas of the author. No posts on this blog are to be considered a GBIF or Institutional policy.